THE DAY FOR NIGHT IDEA LOUNGE with Rob Feld @ Huffington Postsponsored, sponsored by Cannon and the film fundraising platform IndieWire/IndieGoGo held in the Chef Dance space on Main Street, Park City was slammed with celebrities the likes of Selena Gomez, William H. Macy, Gabourey Sidibe, Katie Couric who stopped by for an interview and snag some swag. 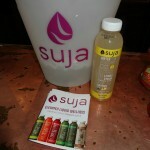 The lounge filled with a mixture of healthy drinks by SUJA JUICE, cold pressed to nourish and cleanse and SUNRIDER teas and snacks created by a chemist and doctor team, along with Sabra Hummus in a cup did the trick to re-fuel the stars. KOOLABURRA showed off their brilliantly styled and cozy footwear with only the top VIPs scoring a pair. Then the marvelous makeup lines PAULA DORF and YOUR BEST FRIEND, served up at the GLOBAL BEAUTY BAR helped touch up the celebrities who came through for their interviews and filled their bags with samples to try at home. Selena Gomez star of the new William H. Macy Movie ‘Rudderless’ at the Day For Night Lounge @Huffington Post with Rob Feld during Sundance 2014.